We’d love your help. Let us know what’s wrong with this preview of My Financial Career and Other Follies by Stephen Leacock. This original NCL collection brings together Leacock’s comic masterpieces, the many varieties of his remarkable humour. In one story a young man is seized by fear as he attempts to open his first bank account. In another, Lord Ronald, the beloved of Gertrude the Governess, “flung himself upon his horse and rode madly off in all directions.” In a third, the Mariposa Belle s This original NCL collection brings together Leacock’s comic masterpieces, the many varieties of his remarkable humour. In one story a young man is seized by fear as he attempts to open his first bank account. In another, Lord Ronald, the beloved of Gertrude the Governess, “flung himself upon his horse and rode madly off in all directions.” In a third, the Mariposa Belle sinks in the shallow waters of Lake Wissanotti. To ask other readers questions about My Financial Career and Other Follies, please sign up. 1. Rather than reading yet another novel I decided to make a change and do one of my written responses on a short story. I found "My Financial Career" by simply clicking on a website that had hundreds of links to short stories and basically picked one of them at random. 2. His name is never revealed in the story so I would have to say my favourite character in this short story would have to be the main character. I really enjoyed this character as he/she is very funny and is a bit of an idiot and 1. Rather than reading yet another novel I decided to make a change and do one of my written responses on a short story. I found "My Financial Career" by simply clicking on a website that had hundreds of links to short stories and basically picked one of them at random. 2. His name is never revealed in the story so I would have to say my favourite character in this short story would have to be the main character. I really enjoyed this character as he/she is very funny and is a bit of an idiot and also clueless as to what they are actually doing and saying. 3. "Fairly large," I whispered. I liked this quote because it made me laugh as it is very ironic for the main character to say this in the story. My Financial Career is one of the sweetest, truest stories Leacock has ever written. Who, going to the bank with a rather large sum of money to deal with, has not been rattled by the clerks, the wickets, the whole experience? 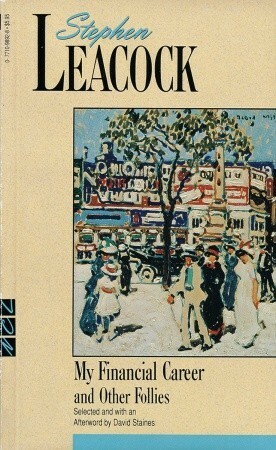 That is the beauty of Leacock in this day and age; he may be writing about lodging houses, the difficulty of staying fit and the state of the rich in the twenties, it is still hilarious and still resonates in today's society. Every time I read Stephen Leacock I cannot believe that he was born in 1869 - some of the stories in this volume were written at the end of the 19th century. His writing seems so contemporary. My favourites in this collection include "How we kept Mother's Day", "My Revelations as a Spy" and "The Love Story of Mr. Peter Spillikins". Here's a piece of trivia I did not know: In 1900 Leacock married Beatrix Hamilton, niece of Sir Henry Pellatt. Another collection of Leacock shorts. Humorous as usual. Interesting essay at the end about the grace of humour in a godless world. Stephen Leacock was brilliant. Were he alive today he might be a writer on SNL. Then again he might choose to continue to march to his own drummer. The world needs more Stephen Leacocks. I highly recommend this series of short stories which were entertaining and humorous. I will be seeking more Leacock books in the future. Stephen P. H. Butler Leacock, FRSC, was a Canadian teacher, political scientist, writer, and humorist. Between the years 1915 and 1925, he was the best-known English-speaking humorist in the world. He is known for his light humour along with criticisms of people's follies. The Stephen Leacock Memorial Medal for Humour was named in his honour.